A new day dawned yesterday after a night of partying I described in part 1. Too bad it was about the last time we got to see the sun. Instead, I went down to grab breakfast and remarks fron three U.S. Senate candidates. 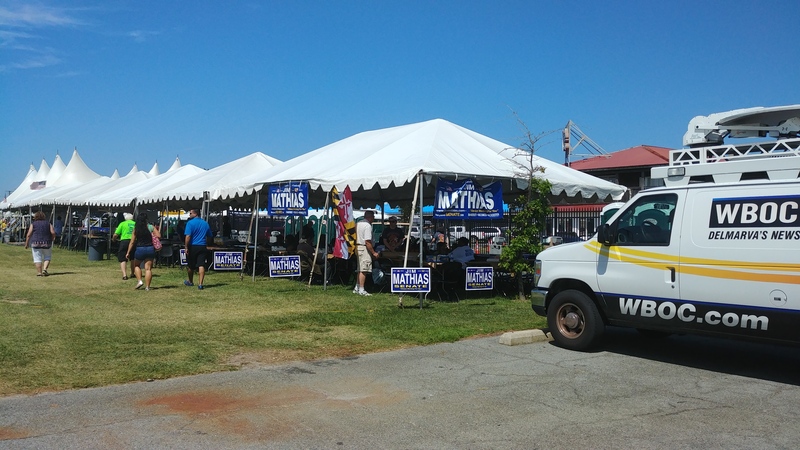 It should be noted that a fourth, Anthony Seda, “has never reached out” to the MDGOP, according to Diana Waterman. After an opening prayer where Delegate Deb Rey prayed that we “cruise to victory,” we did the speeches in alphabetical order. This meant Richard Douglas spoke first. Richard noted the news was still filled with images from Paris, Belgium, and Mali, saying it underscores that “terrorism…remains a concern.” He added that the authorization to use military force passed after 9/11 remains in effect today. He added that growing up abroad made incidents like the building of the Berlin Wall and Cuban missile crisis “indelibly etched in my mind.” But he assured us we are stronger than Russia – we just have a leadership problem. No one is pushing back on Russia, China, or Iran, he continued. Douglas pivoted to domestic issues with a mention of the Bladensburg Cross, a court case he’s assisting on and one for which he predicted “we’ll take the wood to the humanists.” It led into his thought that the job of a Senator was not to pontificate, but to act. In Maryland, it meant not just doing what he could at the federal level to eliminate the rain tax and entice industry. One example of the latter was the Howard Street Tunnel, which is too shallow to accommodate double-decker rail cars. It’s a problem the current Senator has had 30 years to address. The son of Greek immigrants, Chrys Kefalas opened by saying, “I’m a story that’s brought to you courtesy of the American Dream.” He then detailed a life of precocious entrepreneurship as a teenage business owner who parlayed that success into law school and eventually jobs with Bob Ehrlich, both as Congressman and as governor. One of his accomplishments with the Ehrlich administration was pioneering criminal justice reform. After a stint at the Eric Holder Justice Department working on a “smart on crime” initiative, Kefalas is now a vice-president at the National Association of Manufacturers. “Manufacturing is coming back,” said Chrys. America has the advantages of innovative and productive workers as well as affordable energy. Taxes and regulations were holding us back, he explained. Kathy Szeliga emphasized her working-class background and that she and her husband Mark “believed in the American Dream.” For most of her life she’d played the various roles working moms did. 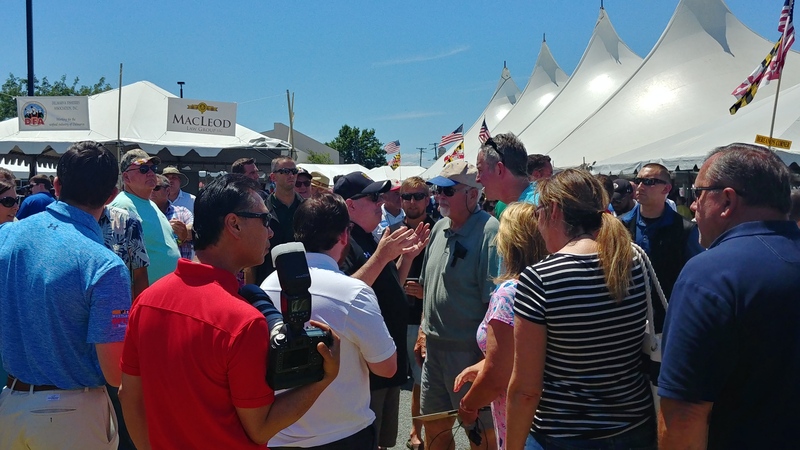 But Kathy stressed her more recent past, talking about how she and fellow Delegate Nic Kipke “brought some new ideas to Annapolis.” She also learned how to work across the aisle there. Her pet issues if elected would be quality of life, security, and schools. Most of her remaining time was spent discussing the security aspect, noting that “terrorism is real…we must remain vigilant.” She vowed to support law enforcement as well. So after Diana Waterman thanked her “three amazing candidates,” I had some time to spend in the exhibit hall before the morning session. There I ran into Tanya Tiffany from MDCAN. With the convention opening, we were welcomed by Senator Steve Waugh. In another bit of history, Waugh pointed out that 15 years ago Calvert and St. Mary’s counties were about 2-1 Democrat but now both have a GOP majority. Since Larry Hogan was at the RGA meeting and Boyd Rutherford had a previous personal engagement, it fell to Secretaty of Human Resources Sam Malhotra to extend the governor’s greetings. He went through a laundry list of accomplishments by the administration over its first year, but concluded with the remark “I can’t wait for the next seven years.” He believed we were in the process of changing Maryland from deep blue to “baby blue” to purple to red. As far as Congressional leadership, Harris believed it was the right time to change leadership. Paul Ryan can deliver our message, as opposed to John Boehner. “I don’t believe he communicated well,” said Harris. Andy also believed Speaker Ryan had his priorities in order, putting family first. “It doesn’t take a village, it takes a family,” said Harris. Turning to the economy, the Congressman was waiting for the “last shoe to drop,” meaning an inevitable interest rate hike. If rates rise to their historical rate of 2 1/2% it would mean $500 billion a year in interest payments alone – more than we spend on defense. “The economy is not going to get better” under Barack Obama, he added. Obama’s administration is also promoting the message that law enforcement “is our enemy.” Yet this is a time where we had a real enemy. “What Paris showed us is that 9/11 is not over,” said Andy. Add in the Russian airliner and the Mali attack, and it was no wonder France took action. Hollande “figured it out” that Obama wouldn’t take charge. “This is a setback to him,” explained Harris. Looking back to the state party, Harris believed we were on a roll and the Democrats were worried. Now we have to recognize the importance of local elections and raise money for the local Central Committees. “Only 350 days until Election Day,” Harris concluded. We then heard from Steve Waugh again, who gave the Senate portion of the legislative update. “The magic number today is 19,” he said, referring to the number of Senators required to sustain a veto. He predicted the next session “will be all about Baltimore,” adding that the budget will also come through the Senate this year. Other items to watch out for: paid sick leave, body cameras for police, K-12 education funding, a bottle tax, and “death with dignity.” We also have to figure out how to come up with over $1 billion to service O’Malley’s debt, Waugh added. 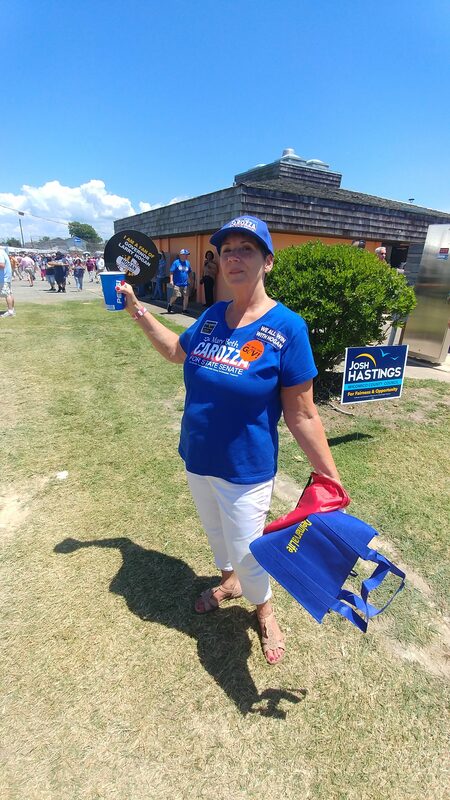 Wearing her Delegate hat, Kathy Szeliga urged us to join the Governor’s press list so we could spread the word about his successes. She harped on the $17,000 per pupil Baltimore City Schools spends, saying we were committed to education but also to accountability. How much is enough?, asked Szeliga. She added there were some successes from the House on the Second Amendment as we ended ballistic fingerprinting, made it easier for armored car personnel to get permits, and removed some accessories from the SB281 ban list. Finally, Kathy urged us to “answer back” to Democratic fundraising. Shifting gears, we heard from Lucas Boyce of the RNC regarding their new philosophy to “engage, embrace, entrust” and the Republican Leadership Institute. Diana Waterman was working to bring some RLI graduates to work here in Maryland. Boyce wrapped up the morning session, so we adjourned for two seminars and lunch. The first seminar I went to featured Nicolee Ambrose. There we discussed two somewhat disparate but vital topics: grassroots organizing and public speaking. On the latter, we did a pair of “American Idol” style auditions where “contestants” were judged and advised on a two-minute speech. It’s really hard to talk for two minutes. I didn’t take a photo at the second one, but Justin Ready spoke on some of these same topics and more. Not taking Justin’s photo means I have a cleaner lead into the National Committeewoman’s report Nicolee delivered to start the afternoon. 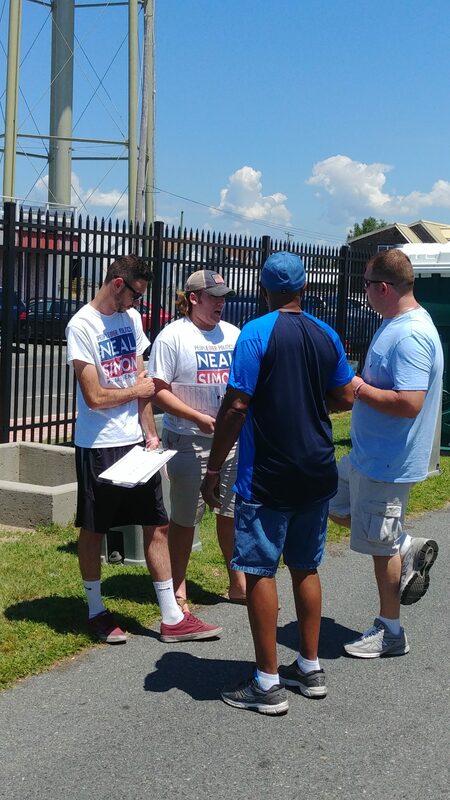 Nicolee pointed out some of our engagement events featuring Alveda King and J.C. Watts in Baltimore City, adding that getting Republican totals to 25% there makes us a red state. She also announced the winners of our voter registration contest for various-sized counties. Ambrose was happy about going “2 for 2” with her Super Saturdays, winning with both Michael Esteve in Bowie and Muir Boda right here in Salisbury. “This man was an animal” when it came to door-knocking, said Ambrose of Boda. She also praised Patrick McGrady for winning for mayor in Aberdeen. A man who hosted a “phenomenal” house party, according to Diana Waterman, Louis Pope gave the National Committeeman’s report. He focused more on the national scene, saying the RNC was “far more viable” than at any other point in history. And although this success wasn’t being picked up by the mainstream media, the ground game was “going exceedingly well…our turnout machine is working.” Now we had 32 GOP governors, added Pope. Noting the CNBC debate showed “how unbelievably biased” the media is, Pope opined the primary season would be over by April 30. After that, it was “absolutely essential” that we come together. “Next year’s election will be a battle royal,” said Pope. The RNC has “a very deep playbook” on Hillary, Louis added. On a local level, Pope urged the Central Committee members to raise money this year for the 2018 elections, since there’s not much competition for funding. This year’s campaign, though, will require “sweat equity,” said Pope. We heard a quick report from College Republican Chair Christine McElroy, detailing their successes – including the Salisbury University CRs co-sponsoring our Lincoln Day Dinner. But she also revealed the sad fact that 77% of millennials could not identify even one of their home state Senators. Party Executive Director Joe Cluster went over voter registration, pointing out the five counties (including Wicomico) where the GOP is closest to overtaking Democrats. “The numbers are moving in our direction,” said Cluster. 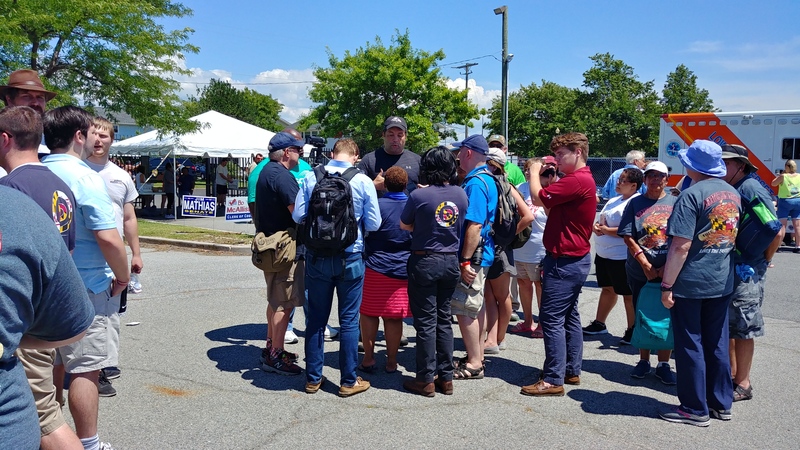 He also touched on goals for precinct captains, opportunities to help Governor Hogan on boards and commissions, and the Baltimore city elections. In her Chair’s report, Diana Waterman paid tribute to the late Frank McCabe, for whom the party would have a dinner later that evening. But she stressed the need to pass the first bylaws amendment, believing if we fail to adopt this the General Assembly will take the right away. “It is for your protection,” said Diana. First we had to deal with one resolution in support of a Constitutional amendment to reform redistricting. It passed by a voice vote, with just one or two objections. In introducing the first bylaw amendment, Mark Edney of Wicomico County stressed that “we have a problem with the process.” The proposal provides a process but is not specific. While there was spirited debate on both sides, in the end the measure had enough votes to pass. On the weighted voting scale it was 369-170, which exceeded the 2/3 majority required. (In terms of actual people, the vote was 182-85. Only Baltimore City, Frederick, Queen Anne’s, and Washington counties had a majority objecting.) All nine in Wicomico County voted in favor, although I believe we will create our own specific guidelines. On the “loser pays” amendment, an attempt to change it to cover both sides was proposed but was superseded by a motion to table the amendment, which passed with a resounding voice vote. And then we had bylaw amendment #3. I thought it would pass with little objection, but the fireworks began right away. Most of the argument centered on whether the Black Republican group was established enough – those arguing against the amendment frequently referred to the Young Republicans, which reached a low point in chapters and membership shortly after getting an Executive Committee vote. At first we voted on a motion to recommit to the Bylaws Committee, which drew the argument that it came from that committee. But Heather Olsen explained that the committee got this at the last minute and only checks for conformance, not on merits. In the end, the motion to recommit failed 217-324, or 114-156 in bodies. Wicomico was split 5-4 against recommitting. Then we tried to table it, but that motion was rejected by voice vote. The next move was to amend the bylaw to strip the voting rights from every one of the auxiliary organizations. That started new debarte, including a motion to continue debate that lost soundly in a voice vote. The final motion to amend passed 359-178, with the amended bylaw change passing 408-83. (Body counts were 178-91 and 206-41.) Only Calvert, St. Mary’s, Wicomico, and Worcester voted against both. Once that vote was in, the bylaws committee report was done “after 2 hours and 3 minutes.” Before we adjourned, Diana Waterman told us it should never be said we don’t allow enough debate. But I suspect the debate will go on. I’ll have more thoughts later this week. Oh, and another thing. We did a straw poll, with Ted Cruz the winner. 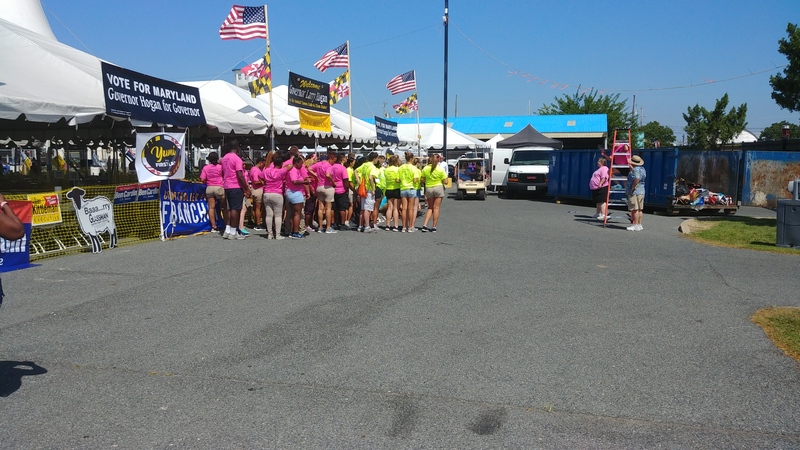 Bereano’s Corner was in roughly the same location, but there was a lot of strangeness about this year’s event. Our tent was in a new location. Some liked the idea of being along the marina, but the traffic walking by wasn’t as brisk as we had when we were in the middle, next to Bereano. It did have a great space for signage that many took advantage of. Being on the grass, we also had our share of bloodsucking biting flies. Speaking of bloodsuckers, the Democrats were less than thrilled with their location as well. 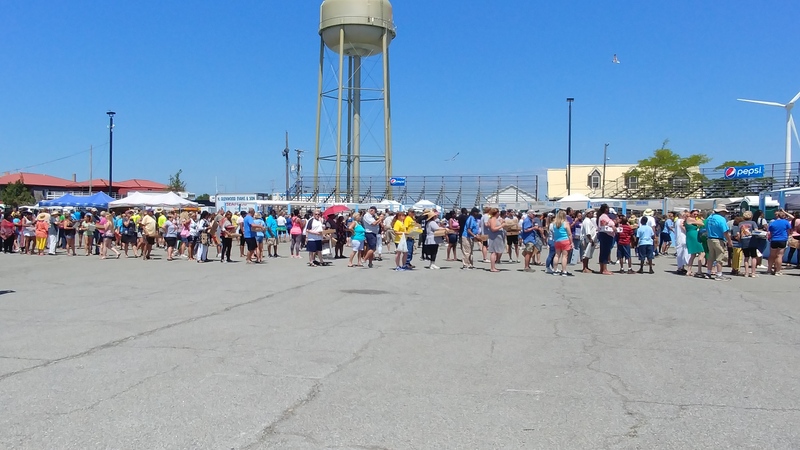 Normally they have been the corner tent in this line. But they did have the keg, not that I had anything from it. They also had an interesting table within. 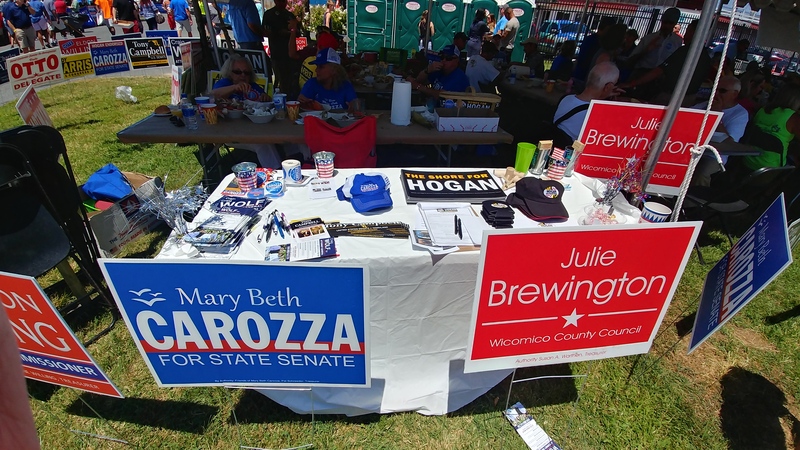 While I am part of working America I’m not a member of this AFL-CIO affiliated organization, so it’s no surprise to find them in the Democrats’ tent. 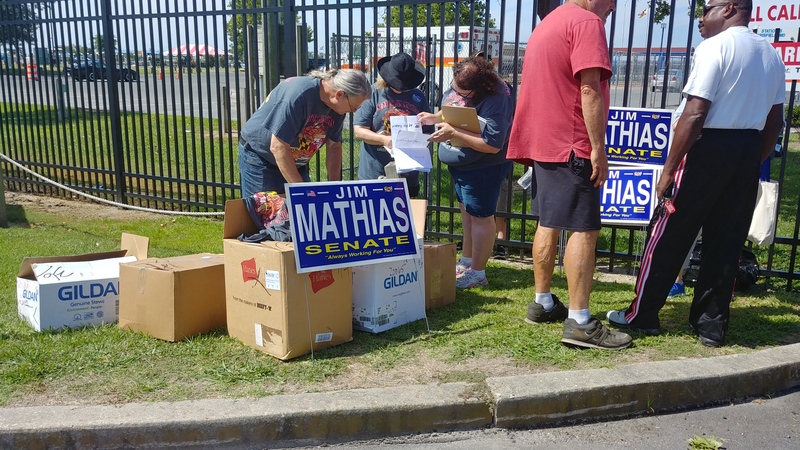 There were a handful of folks walking around with their red shirts on, but Big Labor didn’t have the presence here they did during the O’Malley years. Maybe they are laying low until next year. 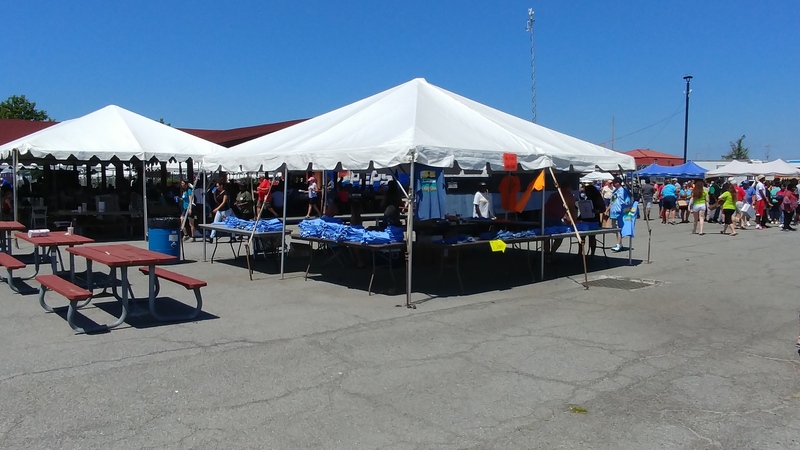 There were quite a few businesses there, although it was a different mix than I recall from previous years. Some enterprising youth took the occasion to be their own business people. Those in orange were “runners” and on their shirts it read they were working for tips. Hopefully they made more money than those who annually charge $10 or $20 for parking in their yard. I don’t think business was as brisk for them because attendance seemed off from last year. 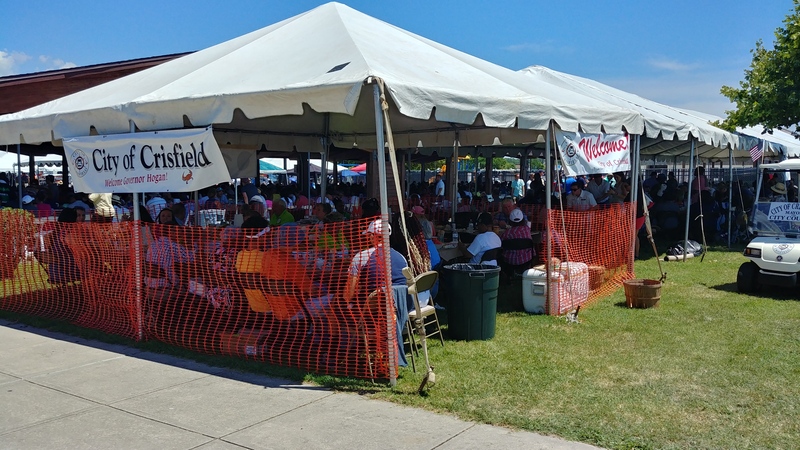 Government and public entities were well-represented, too. Interesting how the environmentalists are cozy with the economic development group. 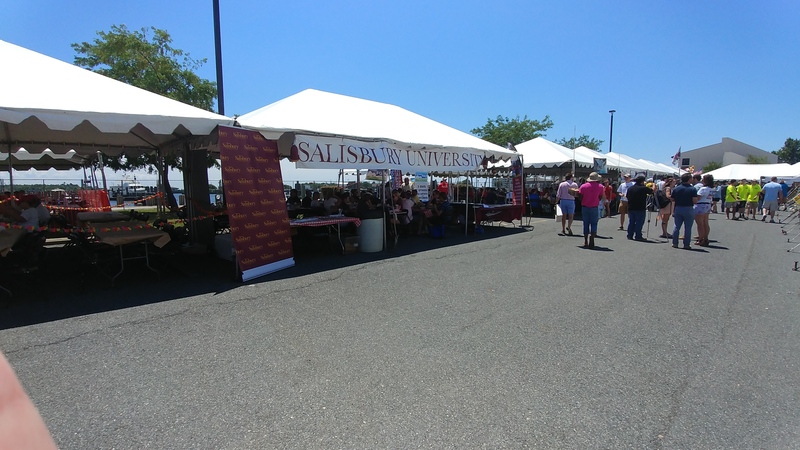 I think the University of Maryland – Eastern Shore was next to the Democrats, but Salisbury University was really trying to make a splash. 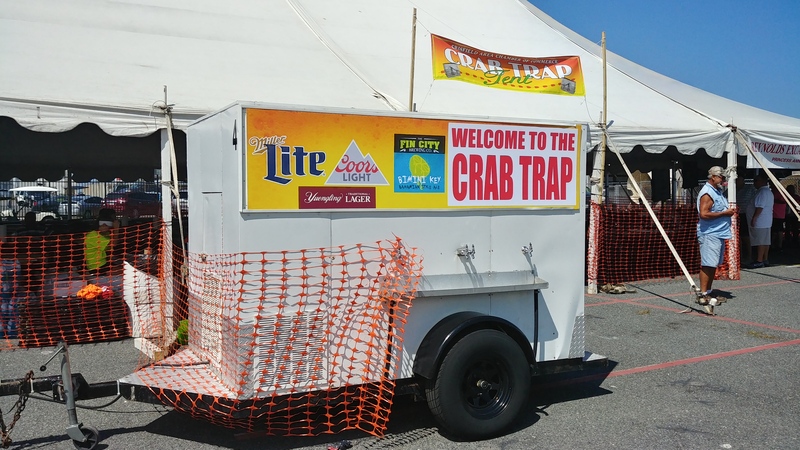 While there were a lot of differences in this year’s rendition of Tawes, some things never change. Lobbyist Bruce Bereano always has the biggest tent. Another constant is a ton of good food, particularly of the fried variety. This was my spread. Not a salad in sight – in my dietary defense, I skipped breakfast. But it was all very good, aside from a little lack of fileting on one of the sandwiches. It was a trifle bony. This event also draws media like the food on the ground draws seagulls. Here’s Delegate Carl Anderton being interviewed by local television. 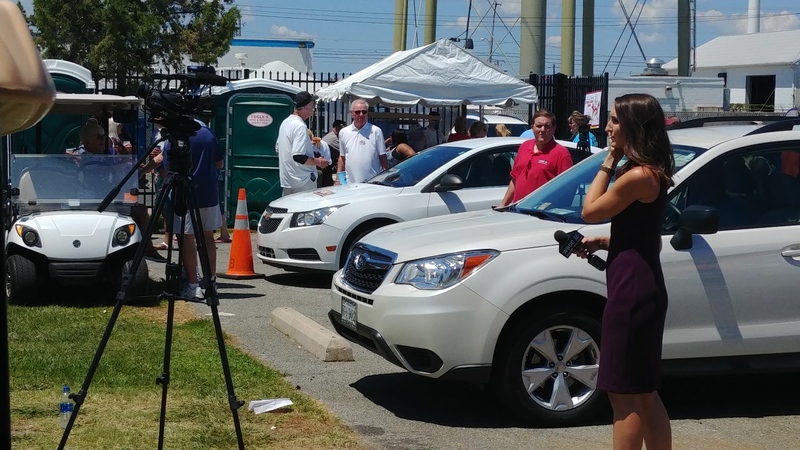 Both local Salisbury stations were there doing live shots and interviews. And while the faces may change, the political aspect never does. You have the newcomers trying to make a good first impression, like U.S. Senate hopeful Chrys Kefalas and his millennial posse. By the way, I had to look up that Kefalas is 35 because he appears a decade younger. You have old hands looking for new positions, like Congressional candidate Mike Smigiel (in the center). He had a batch of “I Like Mike” buttons. County Councilman Larry Dodd is on the right, and I apologize for not recalling the gentleman on the left’s name. And then there were established officeholders like my 2015 monoblogue Accountability Project Legislator of the Year, State Senator Justin Ready. He’s talking to Jackie Wellfonder, who probably has some sort of social media record for photos with the most officeholders and general friends of hers. I think I’ve already seen her picture with our Lieutenant Governor, Boyd Rutherford. He’s the distinguished-looking guy in the center. One final difference was the weather. While it was relatively comfortable, with a gentle breeze, the clouds rolled in toward the end. It was a fitting end to an event which was good, but perhaps a little off kilter. In fact, I was discussing the future of this gathering with someone who compared it to the Salisbury Festival – a venerable event that didn’t change and eventually withered away. Since the cost went up this year (to $45 a ticket) we’ll see how it affects the plans for next year. As for me, I’d like the center location back. Now that we’ve filled in the gubernatorial primary with all the major players from each party (as well as a handful of lesser lights who probably won’t have the wherewithal to make a dent in the race) it’s time to look at who they are and perhaps why they were selected. It’s been many years since a party nominated a pair of white males to the state’s two top jobs, and once again the tickets are diverse in terms of race, gender, or in a couple cases, both. These thumbnails will be in alphabetical order of lieutenant governor candidates, beginning with the last one to be named today. Shelley Aloi was introduced by her running mate Ron George this morning. 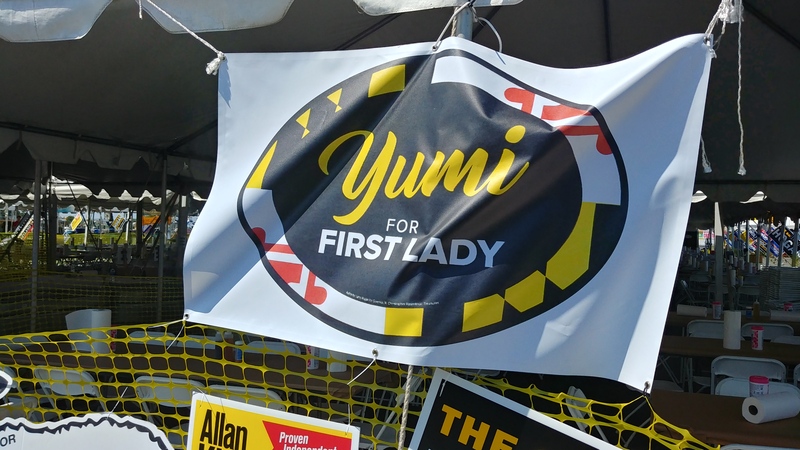 In terms of political experience, she’s in the middle of the pack as she served as an alderman in the city of Frederick for one term (2009-13) before losing in the GOP primary for mayor last year to the eventual winner, incumbent Randy McClement. So she has a little bit of political experience, as well as a diverse resume of accomplishments. In her mayoral run, she stressed a relatively conservative approach of public safety, responsible spending, and job creation. In sum, it was an interesting choice by Ron. Detractors will probably wonder if the move was made out of desperation as a second-tier choice, but Ron has always maintained he would announce his LG late in the game. It’s certainly not a head-scratcher to the level of the ill-fated Kristen Cox selection by Bob Ehrlich in 2006, but may not do a lot to lift the ticket either. Grade: C.
Back in November Democratic contender Heather Mizeur announced Delman Coates as her running mate. In doing so, Mizeur selected a black man with no political experience to round out the twofer of both female and minority on the same ticket. One thing both share is a political philosophy way out on the left wing, as Coates is described as “an outspoken champion on a range of progressive issues, including health care, the Voting Rights Act, immigration reform, and foreclosure protection.” It’s not unusual to have compatible political viewpoints on a ticket, but generally running mates come from the political world or have a business background, and Coates has neither. It may be great for Heather to have in Coates “a friend, a confidant, a brilliant mind and a caring heart,” but when it comes to governing those who have little political background tend to be the most susceptible to a corrupt administration when placed in power. Grade: D.
The first lieutenant governor candidate to be selected was David Craig’s pick of Jeannie Haddway-Riccio, who has dropped the married Riccio name for this campaign. Admittedly, it’s a long name for a sign. 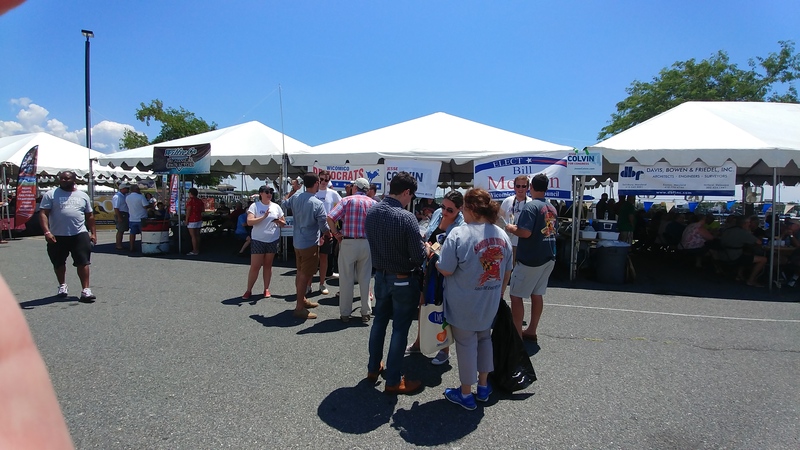 But for several years, GOP observers has believed she would be an ideal LG candidate – young, but with over a decade of political experience under her belt as a member of the House of Delegates and a background from the conservative Eastern Shore. She was a sought-after quality to be sure, and it’s likely she was asked by at least a couple contenders to be part of the ticket. Perhaps the only knock on her was that she only has legislative experience, but that didn’t stop the current lieutenant governor. When he selected her, David Craig said of Haddaway, “I chose Jeannie because she will actually help me run the government.” She hasn’t done anything to hurt the ticket and is the strongest of the four GOP running mates. Grade: A. 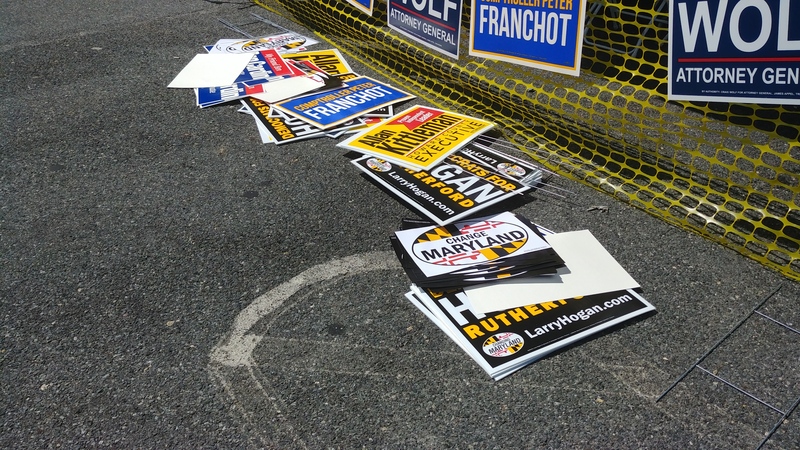 A fellow Delegate was the selection of Doug Gansler in October. Jolene Ivey, of Prince George’s County, brought the requisite balance to the ticket as both being a woman and of mixed race, but perhaps was more useful to Gansler as a counterbalance to Anthony Brown’s background in Prince George’s County. Rather than a business background, Ivey worked in television for several years. But playing up her biracial background and being a mother to five boys didn’t save her from this unfortunate utterance: “I am Trayvon Martin’s mom,” she told the Baltimore Sun last October, just after accepting the second spot on Gansler’s ticket. She seems more like a pick strictly for political expedience than a woman ready to lead, particularly with her unremarkable record in the House of Delegates, even as a member of the dominant party. Grade: D+. 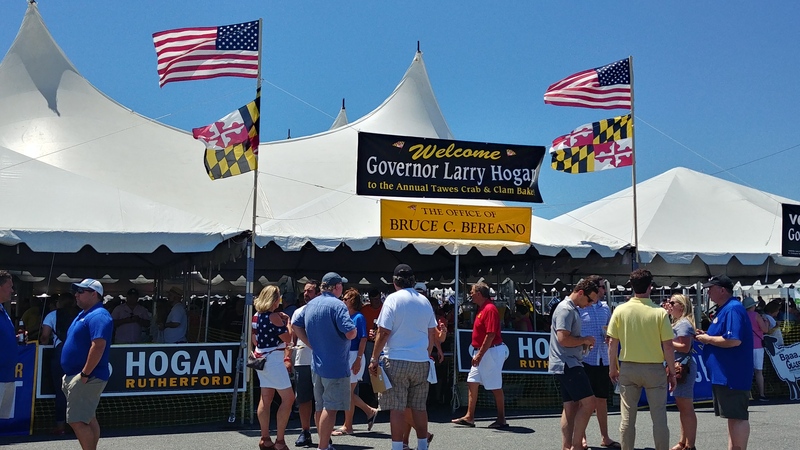 The last candidate to announce his intentions, Larry Hogan took the occasion of formally entering the race to announce Boyd Rutherford as his running mate. The pairing is unusual in that neither have held elective office, but both served in the same Bob Ehrlich administration. In one respect, Boyd is the perfect lieutenant governor candidate given his experience in the public and private sectors, but the question is how he would do in a political campaign. 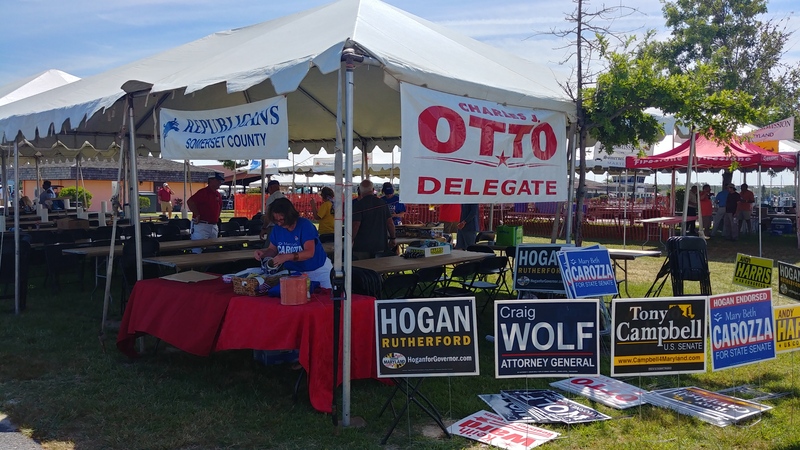 When Hogan selected Rutherford, he said Boyd would bring “real management experience who has the ability to be a full partner in our administration and who is actually qualified to be governor.” If he can work through the rigors of a campaign without making the mistakes a political novice tend to make, he would indeed be an asset. Grade: A-. Perhaps the most unusual running mate of the seven is Ken Timmerman, who was announced as Charles Lollar’s running mate Monday. While Timmerman has campaigned through the state as an aspirant for a U.S. Senate seat in 2000, his more recent experience in that field was being routed by Chris Van Hollen in 2012 for the Eighth Congressional District seat. And while Lollar “intend(s) on using Ken as Maryland’s chief investigator to help us uncover all of the excessive spending and misplaced tax dollars,” according to the Washington Post, one has to ask how Ken’s national and international background really matches up with state government. There’s been the undercurrent of rumor that Lollar was practically to the point of using Craigslist to find a running mate; unfortunately, Timmerman wasn’t the guy to completely dispel the notion. The one asset Ken may have, though, would be that of having the name to possibly nationalize the race for Lollar, enabling him to increase his barren coffers. Grade: C-. It was the ultimate marriage of convenience: two contenders unite to make a strong financial team for the Democratic nomination. Since Anthony Brown was the chosen successor to Martin O”Malley, Ken Ulman made the political calculation that he’d rather switch than fight. 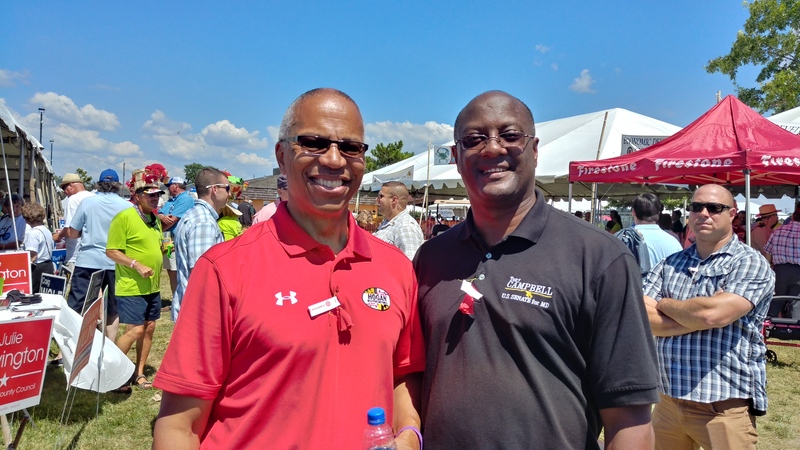 Along with David Craig, Ulman brings executive experience to the race as chief executive of a medium-sized county – Howard and Harford counties are fairly similar in population. 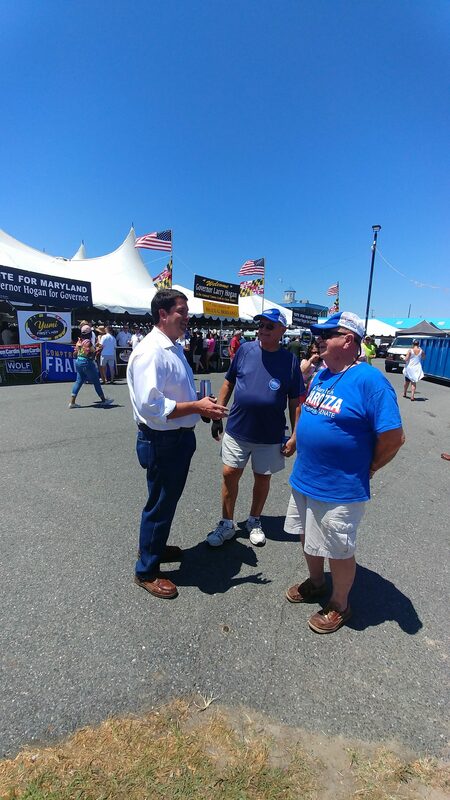 More importantly to the O’Malley wing of the Democrats, the two combined had a warchest large enough to overcome the initial financial advantage Doug Gansler had built up. 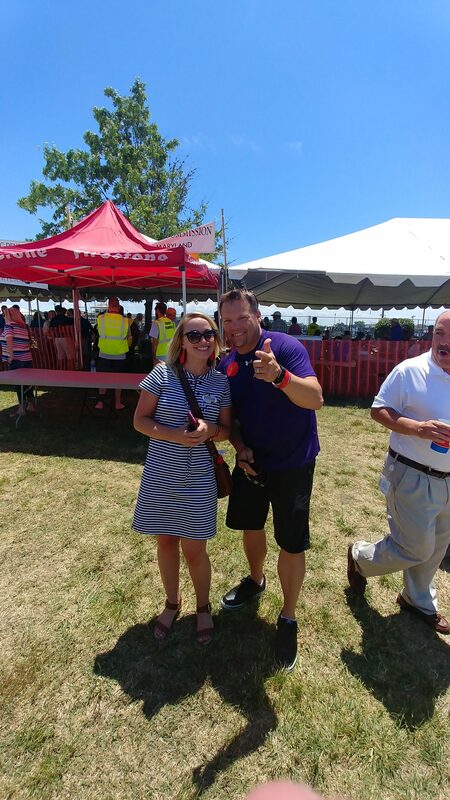 But while I doubt I’d be enamored with all of his political moves, there’s no question Ulman would be able to easily assume the duties of governor should be need arise based on his experience as Howard County Executive. Insofar as the quality of the choice: Grade: A. So we have the seven main contenders now, and the guessing games are over. Let the campaign begin. Well, lady, the answer to the latter question is now “yes” in Larry Hogan’s case. As part of his delayed gala announcement he’s selected former Ehrlich Administration official Boyd Rutherford as his ticketmate. There’s no question that this will lead to the portrayal of Larry Hogan as the lost second term of Bob Ehrlich, since both members of the Hogan/Rutherford team have served in his administration as secretaries. After leaving the Ehrlich administration at the behest of President George W. Bush in 2006, Rutherford has tried his hand at some other enterprises. This certainly presents a study in contrasts with some of the other tickets: Anthony Brown, whose background is mostly legislative aside from serving as Martin O’Malley’s caddy for the last eight years, selected a county executive with a large campaign warchest. Doug Gansler, who came up through the legal ranks, picked a legislator, and Heather Mizeur, a Delegate, selected someone outside of politics entirely, an activist minister. Fellow Republican David Craig, a career politician, looked to a youthful but experienced Delegate. Accordingly, my pledge to you is simple: When Governor Hogan assigns this Lieutenant Governor a policy initiative to implement, I will question and I will monitor, and I will safeguard the spending of your tax dollars every waking hour. That statement had to be a dig at Anthony Brown, who trumpeted his heavy involvement in the Maryland Health Connection until it flopped like a dying flounder. Suddenly he wasn’t as responsible. Also interesting to me is the fact that Hogan is now beginning to flesh out his campaign and his positions. Obviously he has his priorities in order, although I don’t understand the emphasis on “middle class.” I like to think of people as apriring to get beyond middle class. This also puts the pressure on the other two in the race to find their lieutenant governor candidates. 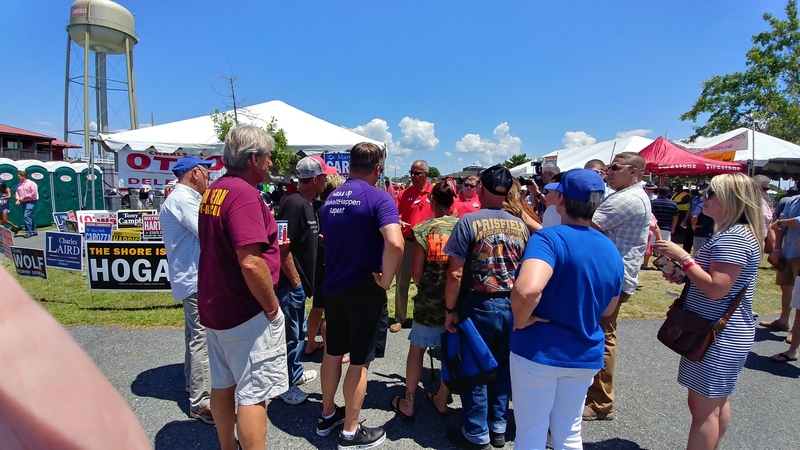 With less than a month before the filing deadline, and with a significantly weaker financial standing than the others in the race, Ron George and Charles Lollar will need to convince someone to join their campaign. 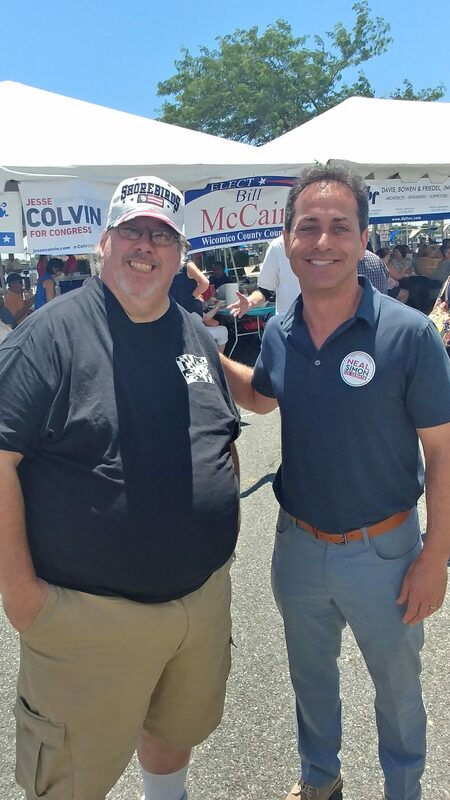 So six months or so after I thought he should have entered, the evolution of Change Maryland to Larry Hogan campaign team is complete. And while Hogan enters as the candidate with the most hype, the question is whether there’s more substance than sizzle.